On February 5, European Investment Bank held its annual Civil Society Forum. 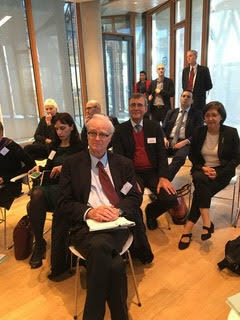 Among the 130 representatives from civil society, the EIB and other stakeholders, were Partnership for Transparency e.V. members, Willem Struben, Horst Feuerstein, and Franz Kaps representing PTF e.V at the forum for the second time. Lina Liakou, former Deputy Mayor of Thessaloniki and Regional Director, Europe and the Middle East City and Practice Management at 100 Resilient Cities. Eckart Würzner, Mayor, City of Heidelberg, and President Energy Cities Network. In addition to these areas, the EIB’s civil society unit will focus on how the EIB can strengthen its engagement with civil society. PTF/PTF e.V. remain eager to participate in these efforts.